Instagram contests bring in followers – one industry study showed a +70% increase in followers for accounts using contests. We wanted to share some ideas that any business could try. 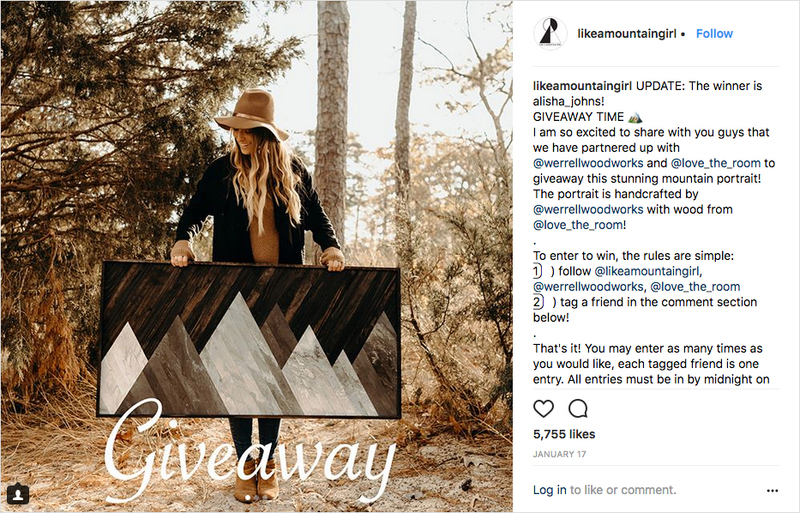 In this post, we’ll look at a handful of Instagram contests, examine why they were successful, and identify key elements that drove their appeal. The Shorty Awards is an annual event that recognizes standout social media campaigns. The awards feature content that has been posted to Instagram, Facebook, YouTube, Tumblr, Musically, and Snapchat. The organization selects winners based on votes from the public and scores from the Real Time Academy, a group of leaders in technology, journalism, business and culture. Here are some noteworthy contests selected as finalists and winners at The Shorty Awards over the past few years. St. Baldrick’s Foundation is the largest private funder of childhood cancer research grants. For Father’s Day 2017, St. Baldrick’s Foundation decided to honor dads whose families have been affected by childhood cancer. Their goal was to inspire people to get involved with the foundation. St. Baldrick’s has been running this contest since 2014 and it keeps getting more and more attention. The 2017 contest attracted media attention from Buzzfeed, Yahoo!, CNN, People, USA Today, CBS, Fox, Inside Edition and PopSugar. Not bad for a user-generated content campaign where the prize was a St. Baldrick’s “Love Your Melon” beanie. 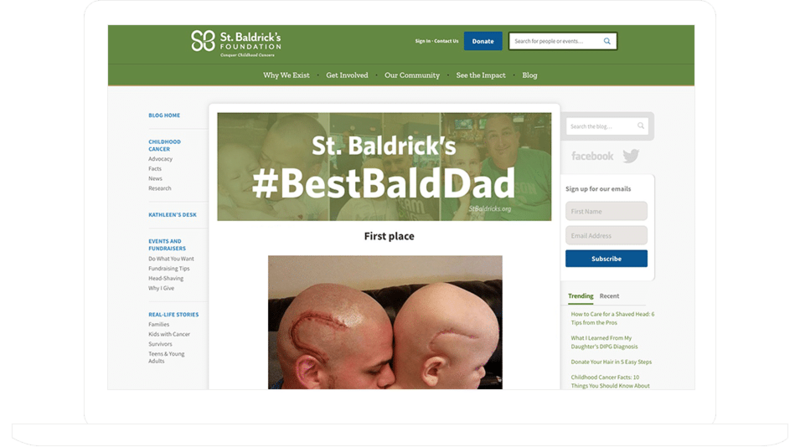 What made the St. Baldrick’s #BestBaldDad contest successful? St. Baldrick’s is taking a terrible situation — childhood cancer — and encouraging people to turn it into something positive. It’s a “feel good” campaign even though there is nothing good about cancer. This contest tapped into a specific event – Father’s Day. You could do a contest like St. Baldrick’s Foundation and collect leads at the same time using ShortStack’s Instagram Photo Upload Contest Template. What made the Old Navy contest successful? Old Navy tapped into teens’ desires to call out their friends — in a good way. 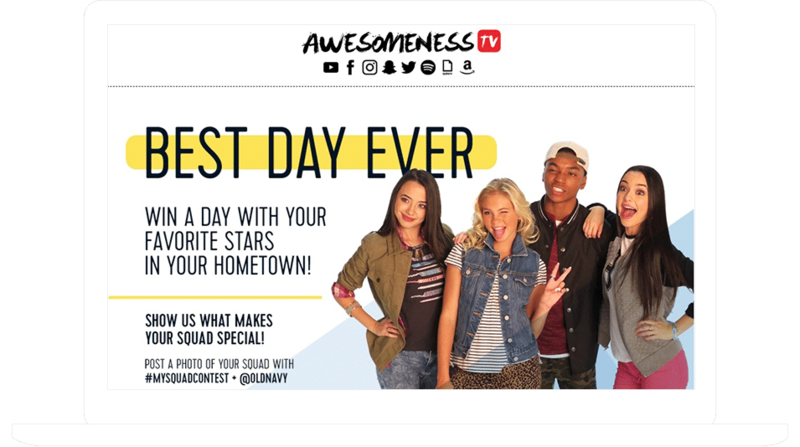 Tweens and teens are all about social media and Old Navy counted on their entrants to help spread the word about the contest. The contest increased awareness of the bank by 57 percent, and drove 1.1 million people to visit the program’s landing page. It also helped the bank surpass its “deposits” goal by $1.5 billion. What made the Ally #LuckyPenny contest successful? • The giveaway sparked a conversation about finances and made people more…invested….in learning about how easy it is to start a savings account. These recent Instagram contests, from large brands and newcomers, also boosted engagement. Here are some additional ideas to think about as you plan your next Instagram promotion. 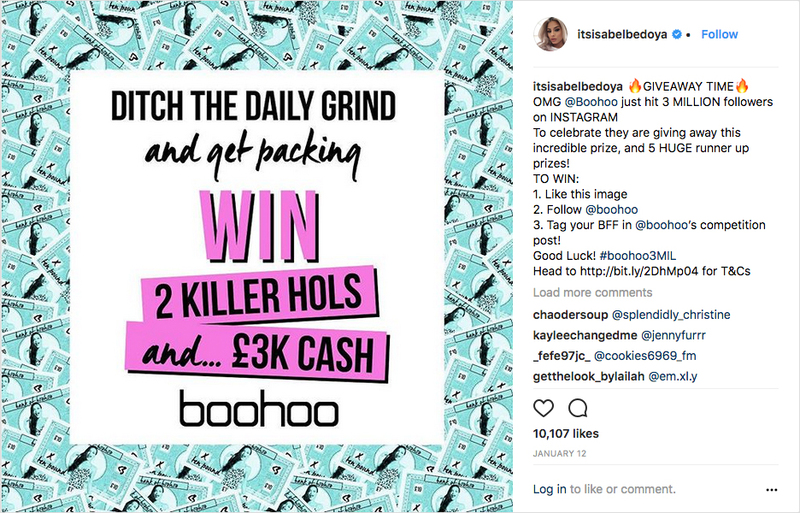 In this contest, boohoo notes they’ve reached a targeted follower count (3 million) and as a thank you, offered entrants the chance to win a tropical vacation. This post alone had more than 10,000 likes. boohoo Clothing hosts contests regularly — which has helped them gather 5.8 million Instagram followers. What made the boohoo Clothing contest successful? boohoo Clothing offered a compelling prize — a vacation and some cash. boohoo often celebrates friendship in their posts and in this one, they ask people to tag their BFF in the post, which helped them reach more people. We have thousands of days devoted to acknowledging various products, behaviors, and events. 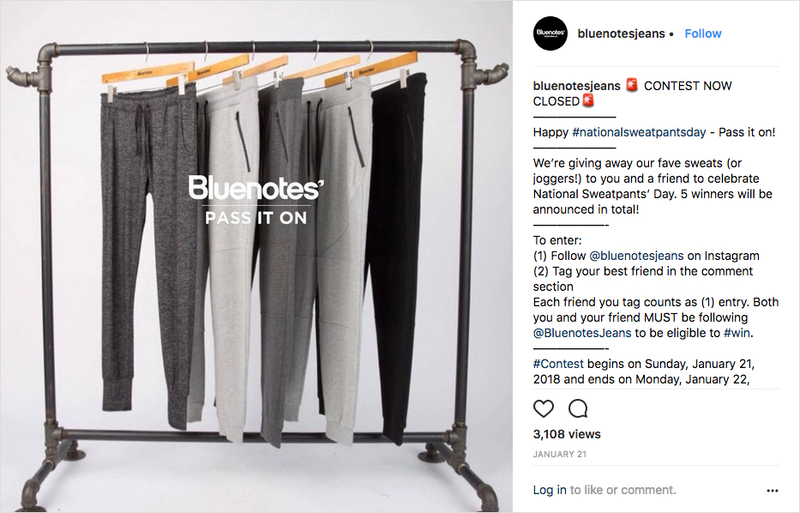 Bluenotes’ Jeans celebrated National Sweatpants Day (yes this is real, it was January 21st) with a contest. Follower gains haven’t been tabulated, but the account, with 21,000 followers, had 14% engagement with the two-day event. Like a Mountain Girl, an online retailer of mountain-inspired apparel and jewelry, partnered with a regional artist, Werrell Woodworks, and an online community love_the_room. Although the contest had multiple sponsors, entry was straightforward. Engagement for Like a Mountain Girl was up +5% — for the partners, who had a smaller Instagram presence, participation gains were more significant. Increasing followers with your Instagram contest is less about the prize value and more about the experience you provide. Evoking a memory, encouraging creativity, offering acknowledgment, expressing gratitude, or simply delivering fun can all attract new followers.